Definition at line 31 of file TypedMsgHdr.h. Definition at line 34 of file TypedMsgHdr.h. Definition at line 19 of file TypedMsgHdr.cc. Definition at line 25 of file TypedMsgHdr.cc. Definition at line 92 of file TypedMsgHdr.cc. References addr, allocName(), msghdr::msg_name, msghdr::msg_namelen, name, and SUN_LEN. Definition at line 273 of file TypedMsgHdr.cc. References ctrl, msghdr::msg_control, msghdr::msg_controllen, and Must. Referenced by prepForReading(), putFd(), and size(). Definition at line 253 of file TypedMsgHdr.cc. References data, ios, iovec::iov_base, iovec::iov_len, msghdr::msg_iov, msghdr::msg_iovlen, Must, Ipc::TypedMsgHdr::DataBuffer::size, and Ipc::TypedMsgHdr::DataBuffer::type_. Referenced by prepForReading(), setType(), and size(). Definition at line 265 of file TypedMsgHdr.cc. References msghdr::msg_name, msghdr::msg_namelen, Must, and name. Referenced by address(), prepForReading(), and size(). Definition at line 101 of file TypedMsgHdr.cc. Referenced by Ipc::HereIamMessage::HereIamMessage(), Mgr::Request::Request(), Snmp::Request::Request(), Snmp::Response::Response(), Mgr::Response::Response(), Ipc::SharedListenRequest::SharedListenRequest(), Ipc::SharedListenResponse::SharedListenResponse(), Ipc::StrandSearchRequest::StrandSearchRequest(), Ipc::StrandSearchResponse::StrandSearchResponse(), SBufStatsAction::unpack(), Mgr::StoreIoAction::unpack(), Mgr::IoAction::unpack(), Mgr::ServiceTimesAction::unpack(), DiskdAction::unpack(), Mgr::CountersAction::unpack(), Mgr::InfoAction::unpack(), and Mgr::IntervalAction::unpack(). Definition at line 46 of file TypedMsgHdr.cc. References ctrl, data, ios, name, and offset. Referenced by prepForReading(), size(), and TypedMsgHdr(). Definition at line 224 of file TypedMsgHdr.cc. References CMSG_FIRSTHDR, cmsghdr::cmsg_level, cmsghdr::cmsg_type, hasFd(), msghdr::msg_control, msghdr::msg_controllen, Must, SCM_RIGHTS, and SQUID_CMSG_DATA. Referenced by hasMoreData(), Mgr::Request::Request(), Snmp::Request::Request(), and Ipc::SharedListenResponse::SharedListenResponse(). Definition at line 158 of file TypedMsgHdr.cc. Referenced by getPod(), putPod(), Snmp::Session::unpack(), Snmp::Pdu::unpack(), and Snmp::Var::unpack(). Definition at line 118 of file TypedMsgHdr.cc. Referenced by getString(), CollapsedForwarding::HandleNotification(), IpcIoFile::HandleNotification(), putPod(), Snmp::Session::unpack(), Mgr::QueryParams::unpack(), Snmp::Pdu::unpack(), Snmp::Var::unpack(), and Mgr::IntParam::unpackValue(). Definition at line 50 of file TypedMsgHdr.h. Referenced by Mgr::ActionParams::ActionParams(), getInt(), Mgr::Request::Request(), Snmp::Request::Request(), Snmp::Response::Response(), Mgr::Response::Response(), Ipc::SharedListenRequest::SharedListenRequest(), Ipc::SharedListenResponse::SharedListenResponse(), Ipc::StrandSearchRequest::StrandSearchRequest(), Ipc::StrandCoord::unpack(), Snmp::Session::unpack(), Mgr::QueryParams::unpack(), Snmp::Pdu::unpack(), SBufStatsAction::unpack(), Snmp::Var::unpack(), Mgr::StoreIoAction::unpack(), Mgr::IoAction::unpack(), Mgr::ServiceTimesAction::unpack(), DiskdAction::unpack(), Mgr::CountersAction::unpack(), Mgr::InfoAction::unpack(), and Mgr::IntervalAction::unpack(). Definition at line 173 of file TypedMsgHdr.cc. References data, Must, offset, Ipc::TypedMsgHdr::DataBuffer::raw, and Ipc::TypedMsgHdr::DataBuffer::size. Referenced by getFixed(), getString(), and size(). Definition at line 132 of file TypedMsgHdr.cc. References buf, String::clean(), getInt(), getRaw(), String::limitInit(), maxSize, and Must. Referenced by Mgr::ActionParams::ActionParams(), putPod(), Mgr::Response::Response(), Ipc::StrandSearchRequest::StrandSearchRequest(), Ipc::StrandCoord::unpack(), Mgr::QueryParams::unpack(), and Mgr::StringParam::unpackValue(). Definition at line 194 of file TypedMsgHdr.cc. References CMSG_FIRSTHDR, cmsghdr::cmsg_level, cmsghdr::cmsg_type, and SCM_RIGHTS. Referenced by getFd(), hasMoreData(), putFd(), and Snmp::Request::Request(). Definition at line 63 of file TypedMsgHdr.h. References data, getFd(), hasFd(), offset, prepForReading(), putFd(), and Ipc::TypedMsgHdr::DataBuffer::size. Definition at line 31 of file TypedMsgHdr.cc. References ctrl, data, ios, name, offset, and sync(). Definition at line 241 of file TypedMsgHdr.cc. References allocControl(), allocData(), allocName(), and clear(). Referenced by Ipc::Port::doListen(), and hasMoreData(). Definition at line 203 of file TypedMsgHdr.cc. References allocControl(), CMSG_FIRSTHDR, cmsghdr::cmsg_len, CMSG_LEN, cmsghdr::cmsg_level, cmsghdr::cmsg_type, hasFd(), msghdr::msg_controllen, Must, SCM_RIGHTS, and SQUID_CMSG_DATA. Referenced by hasMoreData(), Mgr::Request::pack(), Snmp::Request::pack(), and Ipc::SharedListenResponse::pack(). Definition at line 165 of file TypedMsgHdr.cc. Referenced by Snmp::Session::pack(), Snmp::Pdu::pack(), Snmp::Var::pack(), and putPod(). Definition at line 126 of file TypedMsgHdr.cc. Referenced by CollapsedForwarding::Notify(), IpcIoFile::Notify(), Mgr::IntParam::pack(), Snmp::Session::pack(), Mgr::QueryParams::pack(), Snmp::Pdu::pack(), Snmp::Var::pack(), putPod(), and putString(). Definition at line 52 of file TypedMsgHdr.h. References getFixed(), getInt(), getString(), putFixed(), putInt(), putString(), raw(), and size(). Referenced by Ipc::StrandCoord::pack(), Ipc::StrandSearchRequest::pack(), Mgr::StringParam::pack(), Mgr::IntParam::pack(), Snmp::Response::pack(), Mgr::ActionParams::pack(), Snmp::Session::pack(), Mgr::Request::pack(), Mgr::Response::pack(), Snmp::Request::pack(), Snmp::Pdu::pack(), SBufStatsAction::pack(), Snmp::Var::pack(), Mgr::StoreIoAction::pack(), Mgr::IoAction::pack(), Ipc::SharedListenRequest::pack(), Mgr::ServiceTimesAction::pack(), DiskdAction::pack(), Ipc::SharedListenResponse::pack(), Mgr::CountersAction::pack(), Mgr::InfoAction::pack(), Mgr::IntervalAction::pack(), and putInt(). Definition at line 184 of file TypedMsgHdr.cc. References data, Must, Ipc::TypedMsgHdr::DataBuffer::raw, and Ipc::TypedMsgHdr::DataBuffer::size. Referenced by putFixed(), putString(), and size(). Definition at line 150 of file TypedMsgHdr.cc. References maxSize, Must, String::psize(), putInt(), putRaw(), and String::rawBuf(). 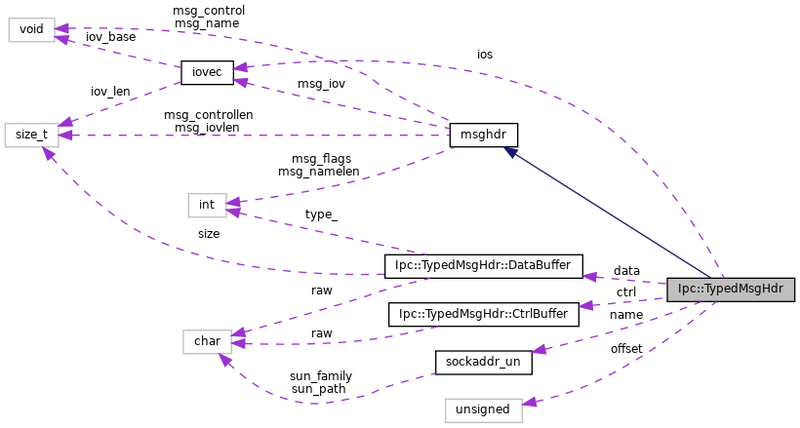 Referenced by Ipc::StrandCoord::pack(), Ipc::StrandSearchRequest::pack(), Mgr::StringParam::pack(), Mgr::ActionParams::pack(), Mgr::Response::pack(), Mgr::QueryParams::pack(), and putPod(). Definition at line 72 of file TypedMsgHdr.h. Referenced by Ipc::Port::doListen(), Ipc::Port::noteRead(), putPod(), and Ipc::UdsSender::write(). Definition at line 73 of file TypedMsgHdr.h. Definition at line 107 of file TypedMsgHdr.cc. References allocData(), data, Must, and Ipc::TypedMsgHdr::DataBuffer::type_. Referenced by CollapsedForwarding::Notify(), IpcIoFile::Notify(), Ipc::StrandSearchRequest::pack(), Snmp::Response::pack(), Mgr::Request::pack(), Mgr::Response::pack(), Snmp::Request::pack(), SBufStatsAction::pack(), Ipc::StrandSearchResponse::pack(), Ipc::HereIamMessage::pack(), Mgr::StoreIoAction::pack(), Mgr::IoAction::pack(), Ipc::SharedListenRequest::pack(), Mgr::ServiceTimesAction::pack(), DiskdAction::pack(), Ipc::SharedListenResponse::pack(), Mgr::CountersAction::pack(), Mgr::InfoAction::pack(), and Mgr::IntervalAction::pack(). Definition at line 74 of file TypedMsgHdr.h. References allocControl(), allocData(), allocName(), clear(), getRaw(), putRaw(), and sync(). Referenced by Ipc::Port::doListen(), putPod(), and Ipc::UdsSender::write(). Definition at line 58 of file TypedMsgHdr.cc. References ctrl, data, ios, iovec::iov_base, msghdr::msg_control, msghdr::msg_controllen, msghdr::msg_iov, msghdr::msg_iovlen, msghdr::msg_name, msghdr::msg_namelen, Must, name, and offset. Referenced by operator=(), size(), and TypedMsgHdr(). Definition at line 85 of file TypedMsgHdr.cc. References data, msghdr::msg_iovlen, Must, and Ipc::TypedMsgHdr::DataBuffer::type_. Referenced by checkType(), Ipc::Strand::receive(), and Ipc::Coordinator::receive(). Referenced by allocControl(), clear(), operator=(), and sync(). Referenced by allocData(), clear(), getRaw(), hasMoreData(), operator=(), putRaw(), setType(), sync(), and type(). Definition at line 90 of file TypedMsgHdr.h. Referenced by allocData(), clear(), operator=(), and sync(). Definition at line 95 of file cmsg.h. Referenced by allocControl(), getFd(), and sync(). Definition at line 96 of file cmsg.h. Referenced by allocControl(), getFd(), putFd(), and sync(). Definition at line 101 of file cmsg.h. Definition at line 92 of file cmsg.h. Referenced by allocData(), and sync(). Definition at line 93 of file cmsg.h. Referenced by allocData(), sync(), and type(). Definition at line 89 of file cmsg.h. Referenced by address(), allocName(), and sync(). Definition at line 90 of file cmsg.h. Definition at line 88 of file TypedMsgHdr.h. Referenced by address(), allocName(), clear(), operator=(), and sync(). Definition at line 108 of file TypedMsgHdr.h. Referenced by clear(), getRaw(), hasMoreData(), operator=(), and sync().